Navigating around Upwave is easy. With the Sidebar on the left side of the screen you'll find what you're looking for. 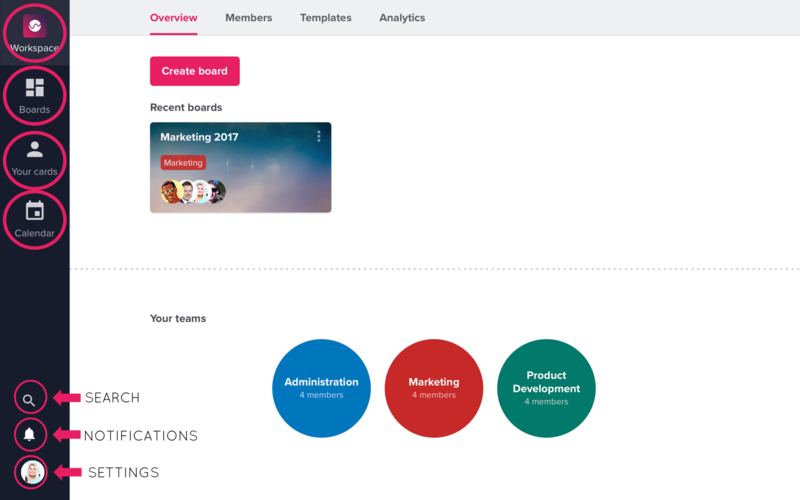 The "Workspace"-tab takes you to your Workspace overview, where you get accesss to your recent boards and your teams. Workspace admins will in additions see all teams in the workspace, as well as templates and analytics. The "Boards" tab gives you a drop down menu of all your different boards, so you can easily go back and forth between different boards. In the "Your cards" tab, you will get an overview over all the cards you are assigned to. Remember to assign to yourself and set a deadline for a card to appear in your calendar! In the calendar tab, you get an overview over all cards in your teams and when they are due. Remember that only cards with due dates will appear in the calendar! You can search for card titles and text(descriptions) across all boards. Just press the magnifying glass in the top-right corner, enter a search term and press "search". Read more here. By pressing the bell icon, you can see all your notifications. By clicking on your profile picture in the bottom left corner, you will find settings. Here you can see your personal settings, Helpdesk, invite people, log out, or switch to another workspace. If you are an admin, you will find also find the workspace administration page here.